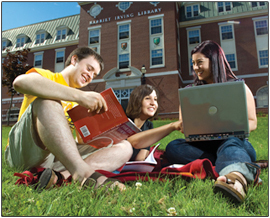 The Harriet Irving Library (HIL) is the main library on UNB’s Fredericton campus and is located directly across from the Student Union Building (SUB). The HIL team is dedicated to supporting the study, teaching and research needs of students, faculty and staff at the University of New Brunswick and St. Thomas University and also act as a resource for the wider community. Use the library catalogue to search the collections or consult our Subject and Course Guides to find the best resources in your subject area. Students will also discover an enriched learning environment incorporating many service points, social learning spaces, technology, group study rooms, and quiet study areas. Wireless coverage is available throughout HIL.